Every March 17, droves of people come out to celebrate St. Patrick’s Day all across the country. And in Connecticut, we like to do it big. Plan to celebrate at one of Connecticut’s many authentic pubs and festive parades. 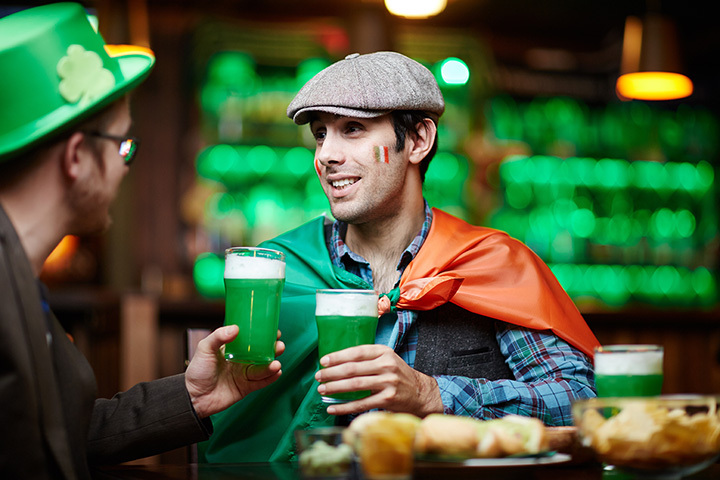 With exciting events taking place across numerous towns and cities, Connecticut will help you find the perfect way to show your Irish pride. The Black Sheep is an upscale Irish Pub featuring an extensive food menu and large, well-stocked bar housed in a beautiful building with original tin ceilings. Celebrate St. Patty’s Day in style at the Black Sheep. One of the biggest New Haven events of the year, this St. Patrick’s Day parade brings out people in droves. From local students to long-time locals, everyone enjoys this celebration. Bouncing from bar to bar, munching on some of the best food in the state, it doesn’t get much bigger than this. Celebrate your Irish pride with a healthy event—a 5K road race beginning on Pearl Street in downtown Mystic. The annual Mystic Irish Road Race is a popular event and attracts many runners in green. Celebrate St. Paddy's day with your friends and family over some great Irish food at the Harp and Dragon in downtown Norwich. Harp and Dragon has 30 beers on tap and scotch and whiskey, so they are certain to fuel your fun. Celebrate St. Patrick’s Day in New London with a parade through downtown. Plan to listen to tunes played by bagpipers while watching school students and groups walking in festive clothes. Don your green garb and four leaf clovers for the annual Greater Hartford St. Patrick’s Day Parade. Arrive early for the 11 a.m. parade, which starts at the state capitol. It truly is a can’t miss event. Maximize your St. Patrick’s Day celebrations at the Stamford parade, which takes place a weekend earlier than many other Connecticut Irish parades — on March 4. Featuring grand marshals that were significant members of the Irish communities in Connecticut, this parade is a truly authentic Irish experience. Located near Quinnipiac University’s campus, Ireland’s Great Hunger Museum features exhibits depicting the Irish Famine from 1845 to 1852. Instead of celebrating St. Patrick’s Day with merriment, spend the day learning about Irish history at Ireland’s Great Hunger Museum. Tigin Irish Pub in Stamford is a great option for authentic Irish fare and contemporary pub food. Though a great choice every day, Tigin Irish Pub is the number one choice for a St. Patrick’s Day celebration as they host festive parties throughout March. Tickets are available for purchase online for this popular event. Another Irish bar to spend your St. Patty’s Day is Blackstone Irish Pub for a delicious meal of Irish cuisine and pub food. Have the bartender make you the perfect Irish car bomb to enjoy in the lively atmosphere of Blackstone Irish Pub. Celebrate St. Patrick’s Day every day at O’Neill’s Pub and Restaurant in Norwalk. Specials and events frequently populate O’Neill’s schedule and include food specials and sports events on television. Featured menu items include shepherd’s pie, corned beef and cabbage, and bangers and mash. The Half Door is a gastropub serving high quality meals in a fun bar setting. With Guinness and Harp flowing on tap, The Half Door is a great option for good beer, tasty food, and Irish pride. Celebrate St. Patty’s Day with Irish step dancing and bagpipe music to accompany your meal. Celebrate St. Patrick’s Day with bingo? Foxwoods Resort and Casino wants to spread some Irish cheer with a bunch of specials and exciting opportunities to score big. Wear some shamrocks for luck and play to have the chance to win!